You have 3643 characters. Don’t forget to add important and relevant keywords in your description to improve your iTunes app page and optimize your SEO. Your app's last version was released on February 19, 2019. It is important to regularly update your app. Best practices recommend to update your app every 4 to 6 weeks. This means fixing reported bugs, improving existing features, launching new features etc. Keep an eye on users' feedback. The next great features may already be asked by many users. 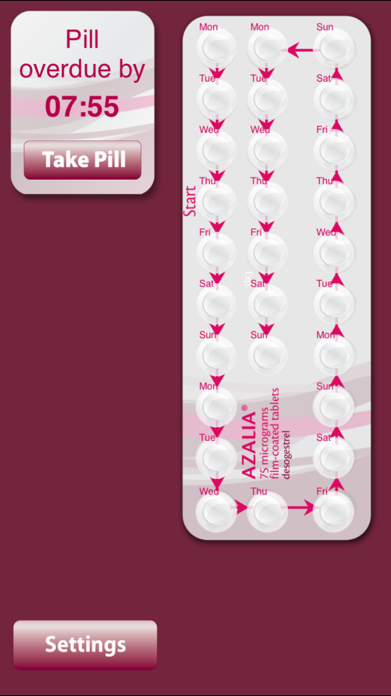 You have an option to click on today’s pill on the virtual blister strip to confirm you’ve taken the pill for the day. Selecting it a second time marks the pill with an X indicating that the pill was missed for that day. Selecting today’s pill a third time will return the pill back to the original “not taken” setting in case you had not taken it. To help avoid any mistakes you will only be able to change your pill status for your current day and past days. The pills for the next day onwards will be disabled. Virtual blister strips begin with the word “Start” and contain arrows to guide you to the next day. A reminder is displayed to count down till your next pill. If you’ve missed taking the pill at the set time then the timer changes to indicate the time the pill is overdue by. Below that is an approximate count of how many days remain till the start of your menstrual cycle. This is not shown if you have selected Azalia®. 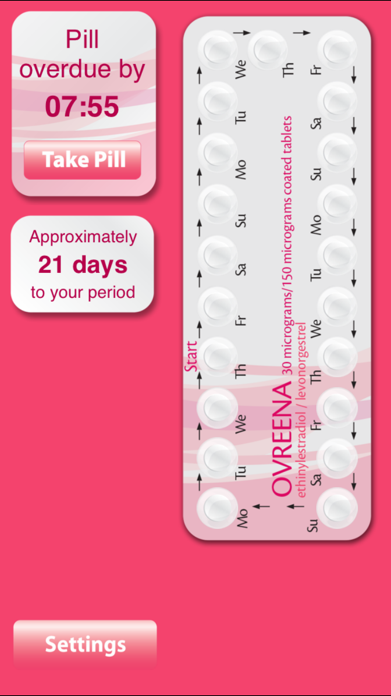 Some women may not start bleeding on the first day but within the 7 day break from the pill. 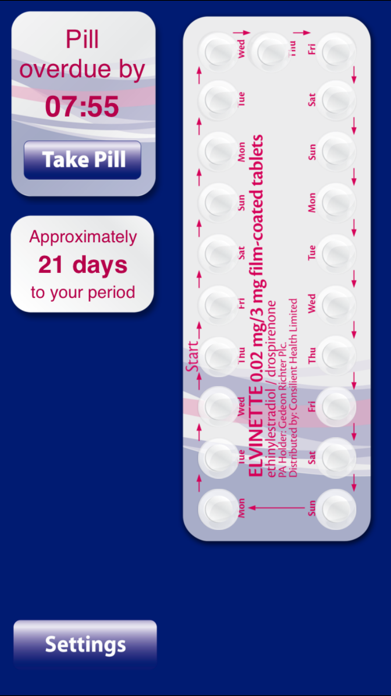 If you experience bleeding outside of the 7 days while taking the pill then you may want to consult your GP. For Azalia® when a strip is empty, you must start with a new pack the next day – without interruption and without waiting for bleeding. When you go on holiday to a destination in a different time zone it is important to continue to take your pills at 24 hour intervals. This app will keep that 24 hour timing as long as your phone remains set to Irish time, which may be different to the local time at your holiday destination. For example, if the app is set to remind you daily at 10am Irish Summer Time (i.e. 09:00 GMT) and you travel to Melbourne then you will be reminded to take your next pill at 19:00 local Melbourne time. If you change your app reminder settings to the local time at your destination, then you will need to calculate the difference in hours to make sure your pills are taken at the correct time. It is your responsibility to make sure your pills are being taken correctly. You will also be notified with a pop-up message if you’ve not visited the app for more than one day. You can then choose to mark all these previous days with missed or taken pills. These can be adjusted afterwards manually by selecting the pills taken to correct the display and your history records. If you experience any side effects, please talk to you doctor, pharmacist or nurse. This includes any possible side effects not listed in the patient information leaflet. You can also report side effects directly via the HPRA Pharmacovigilance Section at medsafety@hpra.ie, by telephone on +353 (0)1-676 4971, or by fax on +353 (0)1-676 2517. By reporting side effects, you provide more information on the safety of this medicine. If you have a medical query about a Consilient Health medicine, please contact Consilient Health at drugsafety@consilienthealth.com or by telephone on +353 (0)1 2057766.